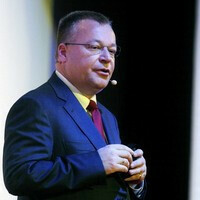 Nokia's current CEO, Stephen Elop, is the first non-Finnish person to be leading the company. He was born in Canada on New Year's Eve, 1963, graduated computer engineering and management in Ontario and has 5 kids, 3 of which are triplets. On September 21, 2010 he took over the Nokia Corporation and this year, the European Association of Communication Directors (EACD) has awarded him with their prestigious award, yet another thing for the Canadian to add to his list of interesting facts about his life. The bestowing of the prize was held at a gala ceremony at the European Communication Summit. The award itself honors superb achievements and is given to the person (or organization), whose communication efforts during the past year have been top-notch. Previous winners of the award include Marc Bolland, CEO of Marks and Spencer (2012), Peter Löscher, CEO of Siemens (2011), and Sergio Marchionne, CEO of Fiat (2010). Are you really really sure?? OMfG....this guy is a idiot all he does is love Microsoft and he doesn't give a care in the world about what happens to Nokia itself.....he discounts all other OSes except WP and doesn't care about how Nokia are doing by automatically ruling out any OS like Nokia or even Meego and Symbian!Im not saying just use android but create a wide version of device using android and WP....this dude just hasn't got a clue...Nokia sack him now and save yourselves because your a very good manufacturer but this guy is dooming you to failure ! Agreed that Nokia had a hard time but it's slowly gaining ground. And whatever he got, maybe he deserved it, maybe he did something worthwhile. Those people who awarded him the title are not fools you know. He's well and all, but can't forget the fact that he terminated Symbian and adopted WP, an OS by his former employer. Symbian is dying before Elop joined Nokia. Could have turned Symbian around? Man, you really have no clue about business, do you? They tried turning it around with Symbian 5th, Symbian^3, Symbian, Symbian Belle, and they continued going down. Also, not everyone wants open source. Closed OS's are faster, simpler, less prone to malware, and easier to update, despite their lack of hacking allowance. Imagine if all computers in the world run on open source OS like Ubuntu. If Symbian ran on current gen processors and GPU, it would beat Android out of the box and humiliate WP8 in terms of features. Application support would have been the only questionable factor. Nokia 808 Pureview and Nokia 701 are very fluid except for browsing, even now, on the outdated ARM11 processor. They killed it instead of using new chipsets with it. They have lot of features right out of the box too. It offers way more functionality than what WP8 does. You're probably right in the technical view of Symbian, but in the common man's view, Symbian is old and crap. It would take something very special for Symbian's image to be changed, and it would cost Nokia a whole lot of money, which they don't have. Better then to go with something new entirely and get cash from MS in the process. Quite right, but Symbian needed a thorough, comprehensive, and EXPENSIVE overhaul to make it work on newer, more advanced silicon. Carla and Debbie were going to gradually work that way but it would have taken until the G or H release to get it up to snuff, and would have been losing customers and market share the entire time. Looking at MR Elop so calm and trust Microsoft all alone. I think Nokia itself has a backup OS. This is the reason why Nokia is not willing to go for Android. I think Nokia will be going for Sailfish OS or even better Nokia Symbian Comeback with a whooping 1 000 000 apps ready for download. The New Symbian phone will pack with 8 cores, 4gb of ram, Ultimate HD screen (4000p), 8000p recording, 82 megapixel, 5200mAH, and something way cooler. "no one buys Nokia devices except cheap ones in 3rd world countries" ??? You just went full retard, never go full retard. I agree TROLL this guy is an idiot! he needs to go if Nokia can stand any chance! sadly, but true. and they are losing grounds on their cheap phones as well. Elop has to go if Nokia want to return to the former glory.....full stop!